Could this be the end for the humble pizza delivery boy? Drones are being used for more and more these days, and with online shopping website Amazon testing the waters for drone-delivery of packages, it was only a matter of time before drone-delivered pizza became a thing. In New Zealand, that dream has become a reality, with Domino's pizza aiming to make its deliveries by air. "It doesn't add up to deliver a two kilogram package in a two-ton vehicle," said Scott Bush, a general manager for Domino's Pizza Enterprises New Zealand. "In Auckland, we have such massive traffic congestion it just makes sense to take to the airways." "We want to push it as hard as we can and roll it out globally throughout our seven markets," Bush said. The markets Bush is referring to are Australia, Japan, The Netherlands, France, Belgium and Germany, as Domino's in these countries are operated by a completely separate entity to the US chain. 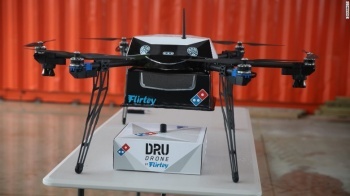 In other words, don't hold your breath for drone-delivered pizza in the US quite yet!